It’s so easy to lose track of time when you travel. In fact, that might be one of the most blissful aspects of setting out for distant lands, this sense of timelessness when you no longer know what day of the week it is, what month, or what holiday. Of course, finding yourself unaware of a passing holiday is more common when you’re in a foreign country with a foreign calendar...especially when you’re in a foreign country like Italy, where it seems that every other day the nation is commemorating a historical event, saint, or random day of R&R. Here you are, happily getting on with it, when suddenly—and, to you, inexplicably—you find museums closed, hotels booked, and a procession complete with marching band and Madonna statue weaving its way down the main Corso. Tweetable: Cities across Italy will be celebrating the Feast Day of Saint John next week with fire and water. One of the holidays that often sneaks up on visitors to Italy is the Feast Day of Saint John the Baptist--La Festa di San Giovanni--on June 24th (John the Baptist is the only saint whose feast day is celebrated on his birthday rather than his date of death, incidentally). Though not a national holiday, it is a festive occasion in a number of Italy’s most important cities where San Giovanni is patron saint, including Florence, Turin, and Genoa. If you are traveling through Italy during late June, you may want to join in on one of these celebrations, which are infused with centuries of local history and culture. Though they take place hundreds of kilometers apart, they are united in their themes of fire and water, two elements linked to Saint John from pagan tradition. Perhaps the Festa di San Giovanni with the most pomp and circumstance is held in Florence, where celebrations last for the entire day (though there are related cultural events during the week leading up to the 24th). The festivities begin in the morning with a procession in Renaissance costume with a drum corp and flag bearers which makes its way from Piazza della Signoria to the famous Baptistry, where there is a ceremonial offering of candles (once the duty of the noble families of Florence). A solemn Mass follows, during which the city’s treasured relics of Saint John are displayed. 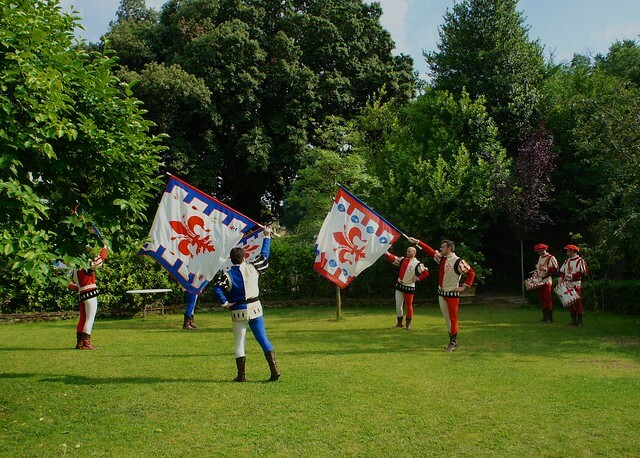 Tweetable: Take in a game of calcio storico in Florence for the Feast Day of Saint John. Though not as showy as Renaissance Florence, sedate Turin has her share of fun during the days leading up to the 24th. Sporting events, concerts, costumed processions, and lots and lots of vintage car parades (this is, after all, the historic automobile capital of Italy) pack the calendar for the entire week preceding the feast day festivities. That said, the most interesting events for visitors to Turin fall on the 24th and center around the Po river. From a regata in the early afternoon, followed by an evening Palio in Canoa (canoe race) and fiaccolata (torch-lit boat procession), and ending with a fireworks display at 10:30 pm from the Ponte Vittoria Emanuele, the day can be spent almost entirely along the river bank. Tweetable: Turin and Genoa have firework displays over water for their Feast Day of Saint John celebrations. This maritime city has a particularly strong affection for its patron saint, the relics of whom are said to have the power to calm the waves of rough seas, and the raucous celebrations here are testimony to this enduring devotion. On the eve of the 24th, the tiny Medieval alleyways in the city’s old town are a festive jumble of bonfires, torchlit processions, street artists, rambling musicians, food stands, meandering crowds, and general merriment. At midnight, citizens gather in the central Piazza Matteotti to light the year’s main bonfire. The next day, Genoa reminds visitors of its former wealth and power during the procession from the Cathedral of San Lorenzo to the historic port, carrying precious gilded statues and religious artifacts of stunning artistry. The procession ends with a blessing of the sea and city by the Archbishop, and—of course—late night fireworks over the water. There are a number of other cities across Italy which also host events for the Festa di San Giovanni. On Lake Como, the Sagra di San Giovanni on the weekend which falls closest to the 24th features a fiaccolata, during which hundreds of tiny lanterns float on the water’s surface, followed by a firework display. The following day, a traditional regata with flower-festooned boats, folk dancing, and flag corp performances are held. In the Cinque Terre, both Monterosso and Riomaggiore celebrate their patron saint during the week preceding the 24th with live music and dancing, processions, bonfires, and fireworks. In Monterosso, the traditional procession ends with children floating luminaries out onto the waves.